Circa 1898-1900. Remains of submarine mining pier. Remnants of concrete substructure to coast; substantial remains of platform pier cut off from land with cast-iron supports and wrought-iron cross-bracing; metal railings to top. The War Department acquired the land related to this pier in 1898. 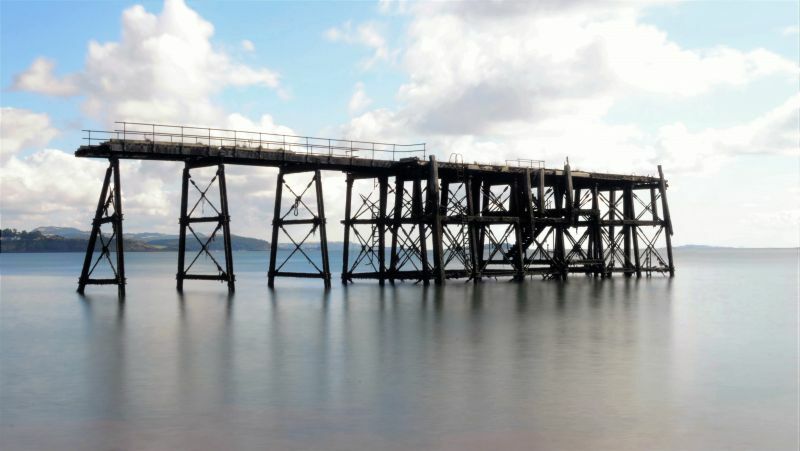 The pier went on to play an important role in World War I and II Forth Bridge and Rosyth defences. The Carlingnose pier was used for handling mines and is related to the former submarine mining station which had observation and gun posts for controlling and defending the minefield. Also in close proximity is the scheduled Carlingnose Battery used during the First World War. Map evidence shows a former tramway line which connected the pier to the mining station located at the south end of Port Laing (this site now demolished). The 1913 map also indicates that there were cranes on the platform pier to lift the mines. A category B listing has been given as this pier exists as a fragment.